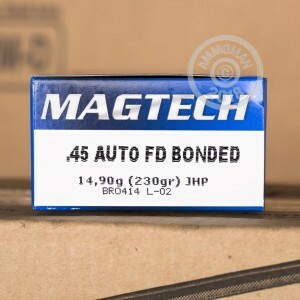 This .45 ACP ammo from Magtech delivers reliable performance for self-defense at a reasonable price that makes practicing with your carry load a realistic possibility. Each cartridge in this case of 1000 fires a 230 grain jacketed hollow point bullet at a muzzle velocity of 837 feet per second. 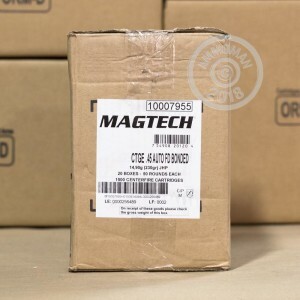 Magtech ammunition is loaded by defense contractor CBC, which also produces its own propellant, brass, and non-corrosive primers to ensure consistency and reliability. CBC is headquartered in Brazil and also owns several ammunition companies in Europe. 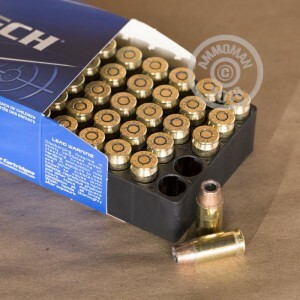 Buy this case or any other items totaling $99 or more to get free shipping from AmmoMan.com--it's a great way to cut your costs and still get the same ammo.